Help every one of your associates better serve customers and nurses and clinical staff improve patient safety and staff productivity. The SB1 smart badge is worn around the neck, arm, or on a belt, and integrated barcode scanning helps streamline task execution, improve task accuracy, answer customers" questions in real time. And with push-to-talk, workers can easily get an instant answer to an urgent question. The result? A more efficient staff who are ready to turn shoppers into buyers. And a higher standard of care that delivers a better patient experience. 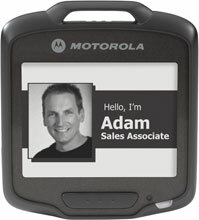 Smart Badge, E Ink Display, 80211b/g/n WiFi, Omni-Directional 1D/2D Scanning, Push-to-Talk Single unit . Interface Cables And Charging Cradle Sold Separately. Smart Badge, Health care Version, E-Ink Display, Omnidirectional 1D/2D Scanner, Wi-Fi (802.11 b/g/n), Single Unit. Smart Badge, E Ink Display, 802.11b/g/n Wi-Fi, Omnidirectional 1D/2D Scanning, Push-to-Talk. 10 Pack!